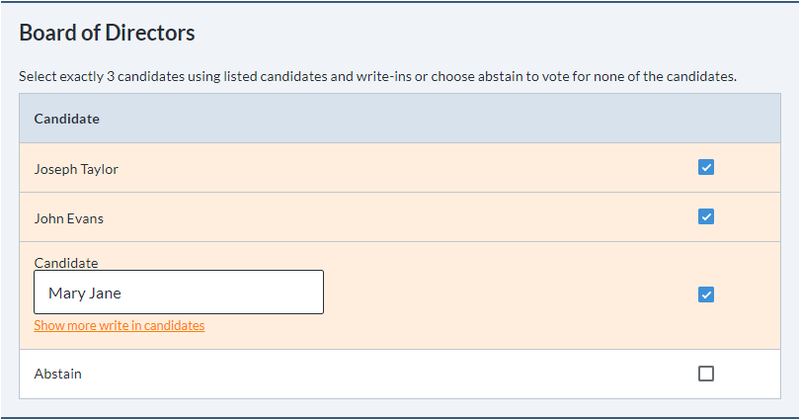 Write-ins allow voters to submit their own choices outside of the candidates or options that have been added by the administrator. The number of write-ins that are allowed on each ballot depends on the number of candidates that can be voted for. If you have more vacancies than you have candidates (for example, if you have three seats available for a Director position, but only two candidates at the time of the election), you can specify that you need three vacancies. Electionbuddy will automatically give you a write-in slot to allow you to try and collect nominations in order to fill that final seat. When selecting a question type/voting method, please note that only plurality-, preferential-, and cumulative-type questions allow the option for write-ins. In your "Ballot" stage of setup, create the ballot question you'd like to allow a write-in on. Click the "+ Add Position or Question" button. Choose the type of question you need from the window that appears. The "Show more write-in candidates" link will open up two additional write-in slots for this question, so voters can write-in up to three candidates.